For The Milestones In Your Life. Diamond Add-A-Links! Most ladies would love to have a quality diamond bracelet that makes a statement, but that can be a substantial investment that quite often is deferred to a future time. Well how about building it one link at a time, changeable and unique to you, and best of all, affordable now! You are never too young or old to wear diamonds. 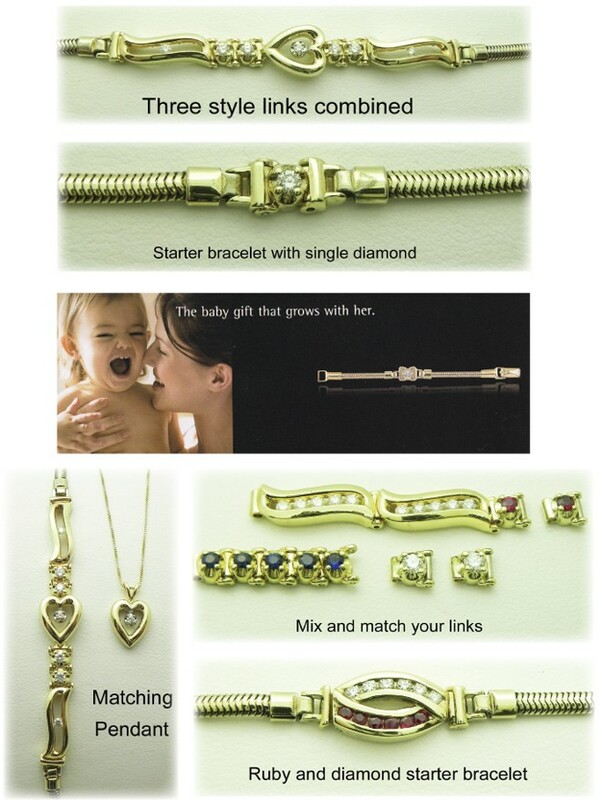 We have started diamond add-a-link bracelets with just a single diamond as a Christening gift for an infant. More diamonds are then added for events such as Birthdays, Christmas, and Easter. By the time they graduate College they have a completed diamond bracelet any adult would be proud to own and since diamonds are forever she will wear it her entire life. 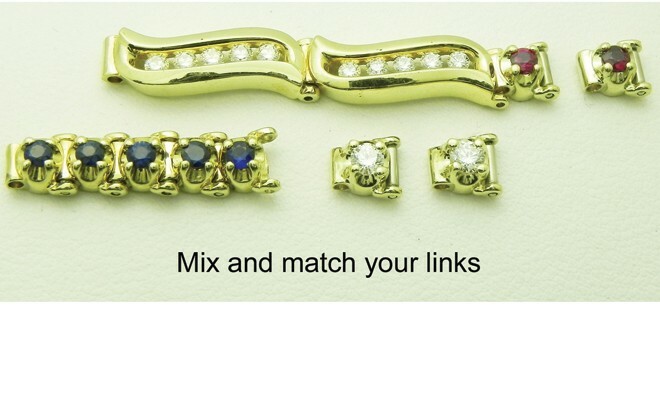 Add-a-links use very fine quality G-H color VS clarity diamonds with an excellent cut. You can also mix birthstones such as amethyst for February or sapphire for September with the diamonds to give the bracelet a more unique look. There are endless events to give add-a-links. They can be given for major holidays, special birthdays, great grades on the report card, a wedding gift, baby push present or Mother’s Day, and the list goes on. The bracelet is started with one, two, three or as many links as you would like. These links are made of 14k yellow or white gold and are attached to a gold filled chain which is complimentary when you start a new bracelet (a $139.00 value). As you add links, the gold filled bracelet is shortened to maintain a proper fit. When the bracelet is complete all of the temporary spring bars that attach the links are replaced with solid gold rivets and the bracelet is refinished at no charge to the customer. With over 100 different links, many of which can be interchanged, you can design the bracelet to suit your personal taste. There are heart shape links, ovals, diamond clusters, single diamonds and strips of diamonds in various shapes, as well as genuine birthstones for any month. Your only limit is your imagination! Your husband, boyfriend, mother, father , children, brothers and sisters or any other family member will always know what to get you for a special occasion or best of all just because they love you. They only have to ask what is on your wish list because we will have a record of exactly what you would like to add to your bracelet. You can complete your jewelry wardrobe with matching rings, earrings or a pendant in the same design as many of the links. 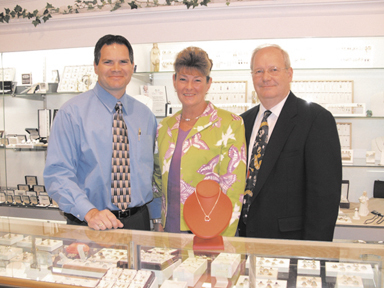 So stop by today and let one of our GIA graduate gemologists or other friendly staff members help get you started. 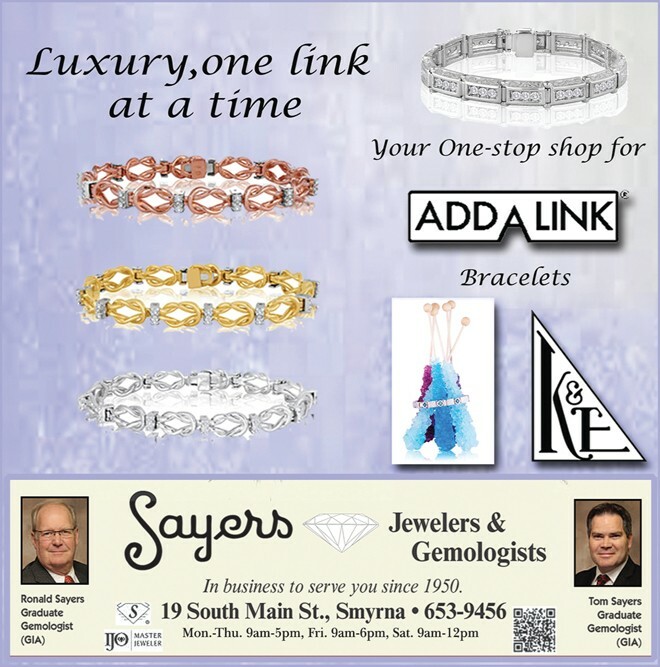 You can also visit our website at www.sayersjewelersandgemologists.com or call us at 302-653-9456. 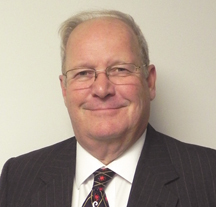 “I just wanted to Thank You for an exceptional job and a great experience that I had yesterday at your store. I came in for a necklace for my daughter and the staff was great. The younger woman that assisted me was very helpful and even offered boxing and giftwrap. The other associates engaged in conversation and were very friendly as I waited for the gift wrapping. FYI . . . Great Experience.” – Stu B. Next Story → A Foundation That Could Treat Your Acne?